Soweto's Vilakazi Street is lit up with 5G, as Comsol aims for commercial roll-out in 2019 in partnership with Samsung South Africa. Comsol Networks, a leading provider of enterprise-grade wireless infrastructure, and Samsung South Africa, have lit up Vilakazi Street in Soweto with a live 5G pilot network. Comsol has access to the largest tranche of contiguous 28GHz in South Africa, making it the local front-runner for 5G services. Samsung South Africa, the market leader in mobile, television and appliances, now looks to expand into the 5G network industry in partnership with Comsol in South Africa. The pilot network was officially switched on on Thursday morning at an event that drew together industry players, technology experts, as well as dignitaries Dr Siyabonga Cwele (Minister of Telecommunications and Postal Services), Tinyiko Ngobeni (Deputy Director General of Department of Telecommunications and Postal Services) and David Makhura (Premier of Gauteng). "Vilakazi Street is the family home to two Nobel Prize laureates, and one of our nation's boldest symbols of transformation and progress," notes Comsol CEO Iain Stevenson. "In our own way, we want to play a role in South Africa's future as we embrace the digital economy, showcasing just what's possible with advanced 5G networks." 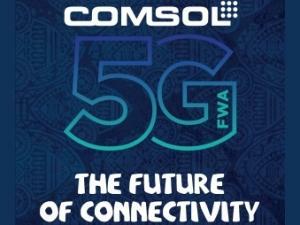 "We are pleased to partner with Comsol for 5G FWA deployment in South Africa. We believe that this is another game-changing initiative for the network industry in South Africa and we will continue to collaborate with Comsol to ensure successful deployment," said Sung Yoon, President and CEO of Samsung South Africa. At the event, Stevenson said the intention is to launch commercial 5G services to businesses and consumers in certain areas before the end of 2019. Stevenson notes the Vilakazi Street pilot network draws on the combined strengths of a number of global and local players: Samsung's 5G solutions, Dark Fibre Africa providing fibre backhaul, and MWeb as the ISP. Stevenson explains while 5G broadly defines the forthcoming evolution of mobile networks over a wide range of frequencies, this specific pilot network is 5G Fixed Wireless Access (5G-FWA). 5G-FWA utilises the kind of network technology that will come to be associated with the 5G era, the likes of beam-forming and a high-frequency millimetre wave spectrum such as 28GHz, to provide an exponential performance boost to wireless broadband services. The companies will demonstrate the potential of 5G-FWA, which will deliver high-quality, high-speed bandwidth services and low latency to complement existing fibre deployments. For the 5G pilot network service, Samsung provides 5G end-to-end FWA solutions, consists of 5G outdoor routers (CPEs) and 5G radio comprising a compact mmWave RFICs technologies and ASIC-based 5G modems developed by leveraging Samsung's in-house expertise and assets. With these technical advancements, Samsung has been able to bring one of the smallest 5G radio (radio base stations) and 5G routers (CPEs) to market, which are the world's first 5G-FWA end-to-end solutions certified by the US Federal Communications Commission (FCC) in the first half of 2018. Peak downlink speeds of 1.75 gigabit per second (Gbps), alongside a number of other incredible performance metrics in early-phase network tests ahead of the official switch-on were reported. "This opens the doors to a new world... one where ubiquitous, high-speed networks deliver digital services to millions of citizens at low-cost. 5G will support everything from self-driving cars to remote medical surgery, new immersive virtual realities, drone deliveries, AI robots, intelligent agriculture, connected cities, smart logistics and more." Comsol Chairman Andile Ngcaba explains the ultimate promise of 5G is the way it could extend to areas that, until now, have remained underserved due to the high costs of deploying today's generation of fixed or wireless networks. "Research indicates a clear correlation between the quality and breadth of a nation's digital infrastructure, and its overall economic output," Ngcaba explains. "5G represents our biggest opportunity yet: to re-energise our economy and to become a winner in the fourth industrial revolution."